Having the right skills is a critical component for landing a new job or any type of career advancement. Librarians and information professionals possess many marketable and transferable skills that can easily equip them to pursue a wide range of information-based jobs or start a new career in one of many related fields within or beyond the library world, such as Archives Management, Digital Asset Management, Knowledge Management, Records Management or Web Site Design. 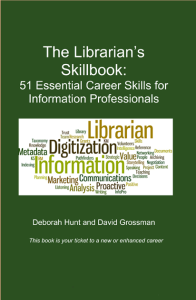 This book reveals the 51 hottest, most sought after library/information skills and shows the reader how to acquire the essential skills they need or how to leverage their existing skillset to obtain a promotion, find and procure their dream job or embark upon a whole new career!